We're underway in Dubai albeit not in spectacular fashion as Federer had to shake off a slow start to beat Tunisian Wild Card Malek Jazir 5-7, 6-0, 6-2. The first set was classic early round Roger, or at least up until 5-5 as usually we see him miss a few early break point opportunities but eventually against lower ranked players he converts one of them towards the end of the set but this time around it didn't happen. After wasting 3 break points early I thought Fed would eventually take his chance but at 5-5 he played a disaster of a service game throwing down a double fault at 15-30 to give Jaziri break points which he took without needing a second invitation. The Tunisian then showed no nerves when serving it out, doing so to 15 to take a hugely surprising lead. Hard to explain the set really, rust? lack of concentration? Even though Roger was lacking practice since Rotterdam I figured he'd come out and put on a show for the crowd tonight but if anything it was Jaziri who was the one focused on entertaining. He pretty much went for broke on everything after holding his opening 2 service games and proved to be a really tricky opponent. After the shock of losing the first set the good news was that Roger didn't get rattled and hit back very strongly to break early and ended up bagelling Jaziri 6-0 to get back on level terms. A champions response really after a sluggish start but I figure he probably just decided he needed focus that bit more and try and ride out Jaziri's gung ho tennis tactics. Similar to Jaziri in the first set Roger only made 48% of his first serves in the 2nd yet still didn't drop a game, kinda shows what a weird match this was. The final set was slightly closer though as Jaziri had a chance to break at 1-1 only to hit a forehand miles long and Roger was able to step it up another gear to break twice to take the final set 6-2. Comfortable by the end of it but that first set scoreline makes the match look more of a struggle than it ultimately was. Well a tough one really, a win is of course a win, not exactly emphatic but more than enough to get the job done. I don't think Federer did anything to get excited about but serving up a bagel was a nice response after the disappointment of the first set and he did start to play better as the match wore on. You also have to wonder if Jaziri wasn't carrying an injury or was in better shape (looked pretty top heavy to me) could it have been even closer? Potentially I guess but I thought the Tunisian played quite well regardless of his injury / fitness and he didn't hold back on any of his shots which on a fast court like Dubai makes it difficult even for the GOAT. You can also look at it from the point of view that if Roger had broken Jaziri's serve on any of his 3 attempts in the first the match would have probably been over in straight sets so it was really his own fault for giving his opponent a way into the match. Like I said though, Jaziri played pretty aggressively and went for the lines which as we all know with high risk comes high reward so he deserved it. The positives for me are that Federer fought back strongly and won 12 of the last 14 games to get through a tricky encounter. The other good news is that court time can't hurt him right now and the court also looked to be playing really fast which should work in his favour. It's worth remembering though that the speed of the court becomes irrelevant if you dont' serve well and Fed will definitely have to improve that in his next match, he was at 54% overall for today which isn't terrible but if he can crank it up to around 60-65% he can make things way easier for himself. It important to sort of react and make sure I didn't panic ,but, of course your mind starts to wander, especially in a match where there is hardly any rallies. He's going for broke on every return. All you're trying to do is get into some rallies, and you're missing a lot yourself. It was a difficult match for me out here tonight, but I'm happy I found a way and got a day off now so I can work a little bit on the game. Just maybe the pressure is off a little bit, and then automatically I will play a lot better in the second round. Federer showing great athleticism on his backhand side to keep in the point here. Next up for Roger is either Marcel Granollers or Albert Montanes both of Spain. Roger leads the H2H against them both 1-0 and 3-1 respectively. Whoever he faces next I think Roger will get the job done without too much of a fuss. He did of course lose to Montanes in 2010 at Estoril but that was Roger 2.0 playing clown tennis back then so it's not really a telling defeat and I doubt it could happen again. Anyway I'm writing Montanes off already as I think Granollers will be the guy that makes it through as he's the better hard court player. As it happens Roger actually played Granollers for the first time in Dubai back in 2011 winning through in straight sets. I figure it will be a similar story should they meet this time around, Gruntollers can be quite tricky as he's consistent but unless Roger plays like he did against Benneteau there's only one winner. I think straight sets 7-5 6-4. Allez! He sounded quite all right in the quotes I read from the presser afterwards (hoping the transcript will be up soon), so that too makes me hopeful for the next matche and if he ups his 1st serve % a bit and plays how he played in part of the 2nd set and most of the 3rd, I think he’ll make it happen in straight sets. Allez! Yeah he definitely got better as the match went on. I watched his interview after, seemed quite relieved but he deserved to get through overall. Jaziri took big risks that paid off early too. His next two matches will be more indicative of his form. I love how quick the courts are playing though, and if Fed can get hot on his serve, he’ll be a force by the end of the week. Should be, gotta serve at above 55% though I think. Tsonga already a casualty! Hopfully this result should give him the confidence and momentum to at least get to Semis and Finals although there are some tough opponents in the way. But i am sure on a fast court and Fed serving like we all know he can, then it should be a good week for Federer. Staying postive always whatever happens( to some degree) Come on Fed. First of all, a bit surprised to see Roger in gray and pink again. Not mention, the shoes! I thought he’d apear in blue or orange the same as Rotterdam…why not? Then he lost the first set out of the blue! Credit to Jarizi, he hold his nerve and played well. Okay, nowadays I try not to be upset about Roger’s form or the progress during his games cos cannot expect him to be perfect all the time in this stage of his carrer but I must say I was concerned about his below par services today (apart from aces), it might be chilly with the desert wind? Though he usually plays great with the wind. Hope his back is alright and he will play better each time towards the final. After the 1st set he recomposed and won the match with his usual fashion so I feel optimistic! I saw his interview, he said it wasn’t too cold but the ball was really flying which made it quite difficult for rhythm. First serve was good when he got it in, couldn’t see any signs of injury but guess we gotta go match by match. Gruntollers next. Allez les suisse! First of all sorry for this comment. I was checking Dopals draw and my gosh hes got two easy qualifiers in his half. With i think Bellucci in his section. Somebody wants him to win this tourny. I think Nadal,Sampras and Federer have each 13 titles in atp 500 for a tied record. 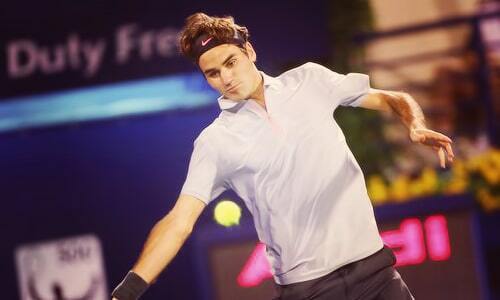 But i would really like to see Fed win at Dubai to win his 14th. Atp500. And then Fed to win two masters 1000 to have 23 and beat Lendls record of 22. And what would really top this season if Fed could win Shanhai and Rome to compleat the set of 9 out 9 masters 1000. This is really annoying me cos the Djoker tied Feds record of 7/9. If Fed is not tired then Shanghai being indoors could be good more than Rome. All the way Roger !!! Sorry spelling mistake i meant ‘ complete’ not compleat. Your forgetting Monte Carlo, don’t think Federer is ever winning there. But would be nice to see him win Rome or Shanghai as you said. However, Rome is gonna be very very tough…Shanghai is more realistic and his reduced schedule might see him get that one finally. I think Djoker becomes the first to win all of the masters. Federer won the Madrid Indoor Masters in 2005 which was replaced by the Shanghai tournament in 2009 so he has “won” shanghai.He had two championship points in the Rome 2006 final too if i remember right. @Sid – Nadal is playing Acapulco. Another clay event of course. As for winning all Masters 1000 – Shanghai is possible but he hasn’t played great there (yet) but Rome and Monte Carlo are touch and go. I’d say Rome is possible but slim. I doubt he plays MC ever again, doesn’t like it there. I must say lack of practice does hurt him a little, not taking away anything from his Jazir. Roger played an average game. Serve is not giving him free points like before. If he is going to have 1 bad day, let it be this match. Don’t think he can afford any slip up anymore after this if he wants to win this tourney. Yep i totally agree with u Dippy. I think he should be ok.
Yeah he’s not had much court time or practise lately. He said he didn’t do a lot before Rotterdam. Not a bad thing yet as the season is still very new, got a lot more to come that’s for sure. So if Dopal only plays the clay court tourny he will more than likely have the record in a few years time. Apparently Nadal missing IW and Miami. Rumored anyway. Just going for the clay season again. I thought the serve was working pretty well overall. He was winning a lot of free points but Jaziri was going for broke a lot, and as Fed said, there wasn’t a lot of rhythm in the match. I also think he’s working on his serve a lot, esp the 2nd one. He’s going for more on it and that’s why he’s double faulting more. He’ll need to tighten that up. Won like 80 odd % behind the first serve, it was dominant when he got it in play. What speeds was he racking up on the second serve? Makes sense to push the boundaries early because he always has to put more on it against Mugray and Djoker. Agree with Jonathon & Kyle, IMO Roger was practicing his 2nd serve as well as his S&V game in the 1st set. When “practice” time was over, he kicked into Fed 3.0 gear and that was it. Do think he did feel some pressure but don’t think he thought he wouldn’t take the match. Remember this year with less tournaments, he wanted to work on his game and some new things which means he needs to try them out in the early rounds w/o risking too much. His 2nd serve is looking good and with his back better, 1st serves are getting back to excellent placement again. I’m sure Rotterdam was a shock to him as it was to us, but in the end we are so happy to watch him play so well at almost 32 and we can’t expect him to win everything! We are so spoiled but love him win or lose! Im not too concerned..he just lost that one service game at a very wrong time.served at 55% which is pretty good(might want to get it up to around 60-65).Anyway what i saw in the last two sets reminded me of how he played in the end of 2011 and the beginning of 2012 he was starting to make crisp forehands unlike the erratic ones which have been a major reason for his title drought.He was timing the ball very well which IMO is a very good sign. The only minor blemish in the last two sets was when he gave jaziri a chance to break which he didnt(i suspect he would have won anyway even if jaziri had broken him)What i didnt understand was why Federer was S&V’ing so much even though he was getting passed.My guess is that the speed of the court encouraged him to do so and the fact that jaziri was playing freely going for his strokes was probably why he didnt win many net points.I do think he will continue with trying to S&V in the coming matches and rightfully so even if that didnt work today.Anyways like you i think he will play Granollers.Should be straightforward like you say.Go Roger! Obviously he wants to conserve energy but he needs to keep the net play to appropriate moments. Hi Arun if Fed won Madrid in 2006 and it was replaced by Shanghai,so how come they dont show that on his Masters result???? Yeah 55% isn’t a disaster, gotta be higher against the better returners though. He could play Davydenko in third round so that will be quite testing. I like the Serve & Volley tactic, he is always going to get burned by some good passing shots just because of the percentages but I think he will win more points at the net than lose. Definitely has to try out these tactics and I wanna see him do it on clay – Henman like! Coming to net consistently is a great thing to do on this court. Worked fantastic for him last year. When you come to net a lot you will get passed sometimes but coming forward a lot means you are constantly putting pressure on guys to pass which is hard even for the best. Agreed. He played pretty smart I thought. A few poor approaches but to be expected! Fed’s been serving a lot of DF this year, but I guess its his back problem. Bit of a surprise to see him in the gray pink outfit again. I dont think he will ever wear the orange one though. Welcome back Pinkerer! Also regarding DF, I don’t think it has anything to do with his back to an extent but he is trying to put more kick on the second serve. He probably needs to when he comes up against Djokovic and Murray who pounce on about anything and everything. Yeah been a few, although not quite as bad as Shanghai against Murray where he served 3 in a row! First of all, I have to say that Federer fans are the best but they can also be the WORST. Everytime something like this happens to Roger most of his fans which are NOT the true fed fans write him off and say he will lose and then go into the next match as if they are with Roger the whole time? I’m sorry but I saw this all over twitter and it was truly irritating. What I think happened was Roger lost concentration at 5-5 and got broken, lost a set. Also Roger looked annoyed in the first set at how many forehand errors he was making which can only be expected with a little bit of rust because f/h looked back to its stunning form as soon as he broke in the second. He refocused and put himself back in a winning position. How many times has this happened? A lot is the answer. So I refuse to see this as a negative in his Dubai campaign. I believe this has now woke him up and he now knows he is in the tournament. Fed didn’t serve as bad as everyone is saying, Jarizi was going all out on the returns and it just made for some pressure. Players/commentators saying courts are slower this year but they still look bloody fast to me! I know I said Djokovic is favourite but fast hard courts could really give a huge advantage to Delpo should they meet. Then again it’s the same for Tsonga and Berdshit. We will have to see. After seeing Roger play now after the whole Rotterdam/back situation, I can say with a lot of confidence that Fed has the form to beat Novak here. I really liked what I saw last night especially with the court speeds. 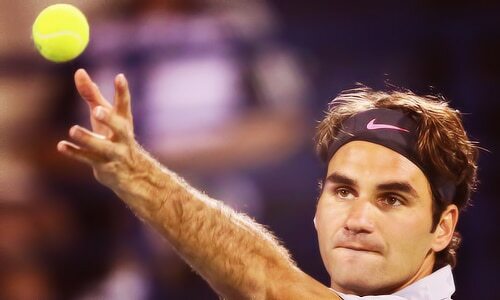 Once his serve gets clicking in the next two matches, could see an awesome week for Fed and us fans! Yeah Fed has loads of fake fans who write him off at the earliest opportunity. Dunno why they do it. It is the easiest thing to do I guess. I just laughed when he lost the first set, you normally get a feel for when he is going to lose and Jaziri match didn’t really have that vibe. Yet people tweeting he’s done lol. Just a neutral match for me, sluggish start, did nothing great but got the win which is all that matters. I thought the courts looked rapid too. Tsonga no longer a factor 🙂 I guess Berdych will make semi’s. Hey! Guess I was right. Tsonga loses early. Classic Jo-Willy! Roger Rasheed has his hands full if he is to make a consistent winner out of him! What with Tsipsy having another first round loss( looks like a tough season ahead for him) and Tomic out thru illness, Roger only has Birdman in his way…. Delpo showed grit when necessary in comig thru. Good to see as we need another player to challenge the top! I see it is unlikely Rafa will play IW or Miami. I do wonder whether Fed will change his mind re Miami if he goes out early here or in IW as would quickly drop to no 3. Unreal how he wins a tournament and then loses in the first round. That’s back to back 1st round losses at 500 level. Poor! I doubt Fed plays Miami. Both scheduling and personal reasons. Making a stand I think! Probably. He’s always been a Clay Court Specialist anyway, just managed to turn up for one hard court season where he managed to add 10mph onto his serve and look like he’d put on 10 stone of muscle lol. Yeah I think that about sums it up… But no, he’s perfectly clean huh? All top players want more antidoping tests except him, cause it’s “too intruding”… My as*! Well there you go Jonathan, Tsonga’s clowned up already in the the first round as I predicted. 🙂 Now we wait for Berdshit. Good call! I thought he would be on a high after winning Marseilles. Bad loss for him really. Such an enigma. Funny, I mentioned to a friend that Llodra will give Tsonga a big headache. Turns out it was more than just that. The surface aids Llodra’s game. The only pure serve and volleyer left, I think. yeah, we need more players like llodra, they make they game just that much more interesting. That is what the slowness of the courts has brought out: the extinction of a playstyle. Yeah I didn’t see he was playing Llodra. Surprising loss all the same. Llodra is fun to watch though, unconventional but definitely can come up with some shots. Hi all… Is that confirmed that Nadal wont be playing any hard court tournys or is it speculation. And what about US open and the hard court swing b4 it. Or am i going too far ahead of myself. Most likely he will defend his French open GS and would also play grass tourys aswell including SW19. But with Nadal and his uncle Toni probably already got their targets and schedules ready. But they will only inform everybody late and keep people guessing. Not sure if it’s confirmed but it was all over the Spanish papers. I think he will skip them though for sure. Gotta see what he does at French Open and Wimbledon. He won’t win US Open that’s for sure though. I wanted to know and ask if i could subscribe to ur post on Fed. If there is a fee for having ur post being sent to my email. Believe or not am not that computer savey. If yes or no then shall i go to ur subscription page and follow and complete as appropriate. They get delivered at a set time so you might already see a post before it arrives in your inbox. Not the best system and I’m thinking about changing to something different when I get chance. I will announce it on the blog though if it changes. I am about to introduce a pay per comment system too 😛 Paypal good for you? Whoo hoo! Roger plays at 9 am my time again 🙂 Shukran Jazeelan, Dubai tournament organizers! 3pm for me, it’s all worked out rather quite well! Tipsarevic, Tsonga, Stan, and Nalbandian all lost today. Weird day. Picked Davydenko to beat Tipsy above, think he will play Fed in third round. Cool piece, I like the quotes from him. Not sure about the Leopard analogy though – a Leopard can never change his spots for one. And also, Roger is not a killer. That has cost him many matches in the past against the likes of Dull and Djoker. But I could be taking it too literal. What Fed has to say though, as is usual, spot on! Haha I agree, he is definitely not a ‘killer’. Don’t know what animal would he be…though if a predator, more like a cheetah? I’m predicting that Federer will win another grand slam, he still has the ability to pull out some of the most ridiculous shots I’m sure he’s got another in him based on the above. I don’t think the double faults streak will continue, more of a blip than anything else. I’m hoping he wins the US Open this year. That’d be a dream. It will be tough I think to capture that or any slam but hopefully it’s doable. Also I got your email, will reply this evening, on my to do list. Watch out for Berdych! He seems to be moving rather well and hitting pretty clean. Should be an interesting one should Roger meet him in the SF. Yeah, although he didn’t play as well as the scoreline suggests today against Kamke. Kamke wasted a ton of break points. But you can almost guarantee if he plays Fed he will zone in. Yeah much better match than the one against Jazriri. I think Roger’s first serve return percentage stats are always on the low side and Granollers did serve really well today, with a lot of power and placement which probably made it even more difficult. I guess it’s quite an important stat but not the main one, the ones that I always look at for Fed are 1st serve % and Winner to Unforced Error ratio. Usually hold the key to his matches. Yeah he does a racket spin / helicopter thing, but usually only in Exhos etc. I think he did it at US Open a while back, Youtube Federer racket tricks and it will probably be there, it used to be. I sent you the highlights man. So sit back, relax and let the Fed-times roll!